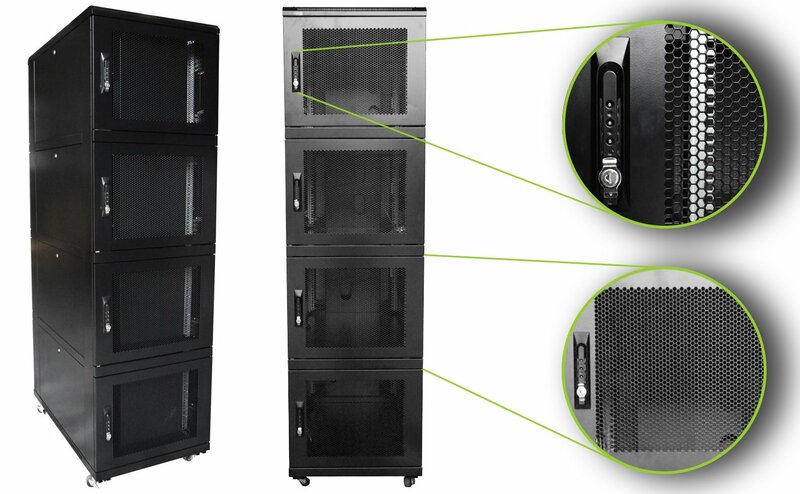 British cabling specialist Excel Networking Solutions has launched a range of data center racks designed specifically for the needs of colocation providers. The Environ CL series features between two and four compartments per rack, each with their own individual lock. This enables customers to purchase rack space in secure modules that offer 9U, 11U, 20U or 23U, rather than having to opt for a whole cabinet or sharing space with other customers. Birmingham-based Excel designs and manufactures copper and optical cabling infrastructure. Environ CL is based on its popular ER series chassis, but offers a few important differences: the main is the division of the rack into multiple, compartments, with mesh doors and full-depth dividing panels. Each compartment is fitted with swing handles that can be unlocked using either a unique key or a three digit combination lock. Customers can optionally install any other Environ locking solutions including those based on digital key codes, proximity cards and biometric data. Cable entry and exit routes are provided via a full height multi section containment system mounted centrally between the equipment mounting rails. The system is designed to allow complete segregation of cables between compartments. Environ CL racks are available in 42U or 47U heights, 600mm or 800mm wide, in grey, white or black. Environ CL range will be available to purchase from September 2017.